Most British police forces will be equipped with smartphones by March 2010, according to the National Policing Improvement Agency (NPIA). Thirty UK forces have already supplied their officers with the phones said Gary Cairns of the NPIA. Mr Cairns was speaking at an event in the Houses of Parliament on October 15. Officers with smartphones spend 30 minutes less per shift in police stations, leaving them to spend more time for frontline duties, he added. The phones enable officers to access databases, such as the Police National Computer, and receive briefings that would normally only be available from within stations. The UK government has provided £80m of funding for the scheme. Bedfordshire Police is one of the forces already using the technology. It says the phones cost £270 per year, per officer. "Our officers were spending almost half their time, 46%, actually in police buildings," Inspector Jim Hitch of Bedfordshire Police told the BBC News. Since the introduction of the phones he says the figure has fallen to 36%. If I'm an officer and I drive into a certain street then I would like to know who lives in that street who would be of interest to me. In Bedfordshire officers have access via their phones to most of the information they can access via computers in the station including criminal records, vehicle details, briefings and photographs of wanted or missing people. They are also able use the phones to send information back to base. Inspector Hitch described how one officer was able to send a photograph of a foot-print of a suspect to headquarters where it was matched with one held on file. He hopes that in the future GPS technology on the phones will enable officers to receive information relevant to the area they are in. "If I'm an officer and I drive into a certain street then I would like to know who lives in that street and who would be of interest to me." Graham Baker of phone manufacturer Research In Motion, sees further developments in the use of location based tools in the next five years. "It could be information on lost or missing people, or particular crimes that have been reported in that locality," he said. Potential problems include limited mobile bandwidth. Graham Baker says the phones are designed with that in mind. "We're not sending huge gigabytes of data". Security is another concern. 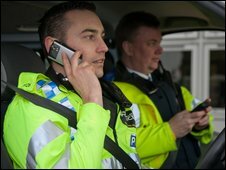 In Bedfordshire officers keep the phones at home when not in use, and like any phone there is a risk of loss or theft. Jim Hitch says the phones require a password to access and can be remotely wiped if necessary. But not every officer with the option to use a smart phone has adopted the technology. Jim Hitch accepts that the use of mobile devices is a significant cultural change. Although the take up rate is about 85%, there are still officers "passively reluctant" to use the technology, he says. Other attempts to reduce the time officers spend in station have focused on cutting administrative work. Gary Cairns rejects the idea that this is an expensive technological solution to the problem of too much paper-work. He believes mobile devices can help reduce the administrative burden on police. "Mobility can act as an enabler to support that", he says.